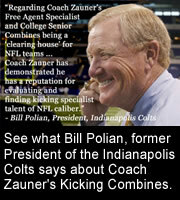 Coach Zauner's College Senior Combine In The Past Nine Years Has Produced Exposure and Results For Many College Seniors. Coach Zauner's 40 Plus Years of Coaching, Training and "Eye" For Special Teams Talent and His Recommendation To NFL & CFL Teams Has Resulted With (79) Specialists Signing NFL Contracts, and Many More Have Been Invited To Mini-Camps. To Date (29) of These Specialists Have Made NFL Rosters and (8) CFL Rosters. NOTE: Per Strict NFL Rules There CANNOT Be Any NFL Coaches or Scouts At This or Any Combine / Camp Unless Organized By The NFL (Example: NFL Combine). PRODUCES EXPOSURE TO NFL TEAMS & RESULTS! To avoid a late fee all payments must be received on or before February 8, 2019. All payments received on or after February 9, 2019 will be subject to a $75.00 late payment fee. All participants must register on line. To avoid a late fee all payments must be received on or before February 8, 2019. All payments received after February 9, 2019 will be subject to a $75.00 late payment fee. 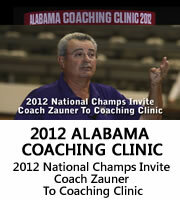 Accepting check (payable to Coach Zauner, LLC) Visa and MasterCard (Credit Cards Subject to 3% Convenience Fee). Combine testing will be conducted with NFL Footballs (K Ball). Combine held at outdoor facility and will be conducted regardless of weather conditions. Combine schedule subject to change without notice. Specialists will be issued a Coach Zauner Combine shirt. 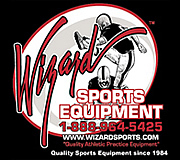 Specialists to bring tennis shoes, 1 football (Intial), kicking shoes, kick off tee, holder & workout equipment. The three groups that are in my evaluation: (1) specialists that currently have NFL potential, (2) specialists, that with more practice, training and better technique could have NFL potential in the future and (3) specialists that would have a difficult time making an NFL training camp. Upon finalizing the results of the Combine, Coach Zauner will contact specialists by phone to inform them what category best respresents their potential and why. NFL Rule: Draft Eligable College Senior Specialists CAN NOT Attend This Combine In March!